Would you rather be home for the holidays or gone? If you chose the latter, you’re not alone. Call it the new holiday and winter tradition. Fueled by demographics, the sharing of photos on social media and shifting consumer trends, more Americans are choosing to take a trip instead of gathering at home. “The boomers are starting to retire, and their millennial children want to have experiences instead of stuff,” says Stephanie Milani, public affairs director for AAA South in Knoxville. This Thanksgiving, a record number of Americans traveled for the holiday – nearly 51 million, AAA research shows. 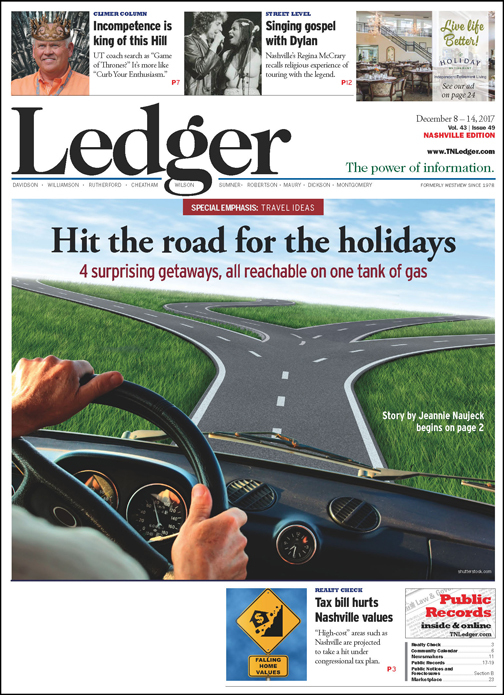 Even more telling, nearly 40 percent of Tennesseans plan to travel 50 or more miles from home during the last two weeks of December. Of those, 47 percent will go to a beach. But a surprisingly high 32 percent plan to travel to a city or major metropolitan area – the kind of trip traditionally reserved for warmer months. “Back when gas prices were high and the ‘staycation’ was re-popularized, it helped remind people that there are treasures within a day’s drive or within a tank of gas that you can escape to,” Milani explains. If getting out of town is on your holiday wish, here are four itineraries for “One Tank Trips” – all within easy range of Tennessee and all with year-round appeal. Winter brings out the cozy in Asheville, North Carolina, an idyllic mountain town that feels like no place else in the South. “Winter is a hidden gem of a season,” says Dodie Stephens, director of communications for the Asheville Convention & Visitors Bureau and a 10-year resident. The world has recently discovered Asheville, necessitating a construction boom that is bringing much-needed hotels and the redevelopment of historic buildings to host those who come to sample its world-renowned craft beers and award-winning restaurants, browse its independent shops and bookstores, hike the surrounding mountains, and check out the city’s burgeoning music scene. Yet, Stephens notes, the city of 89,000 is taking care to preserve the unique culture that sets it apart. “People are very vocal in wanting to maintain what we have, and promoting what makes Asheville special,” she says. The redevelopment of downtown has spurred investment and growth in other parts of the city such as the River Arts District, a center for art studios, performance spaces, restaurants, breweries and entertainment along the French Broad River. Live music venues The Orange Peel, The Mothlight, The Grey Eagle, New Mountain Asheville, Asheville Music Hall and Isis Music Hall are concentrated downtown and around West Asheville, where locally-based acts like Steep Canyon Rangers and Warren Haynes can be spotted when they’re not on the road. “The music scene is really taking off. It’s in every brewery and every restaurant, and we have these great music venues that are now cropping up everywhere,” Stephens points out. “Beer City U.S.A.” has more breweries per capita than any other U.S. city, and the number keeps rising. One of the newest entrants is Ginger’s Revenge, which produces alcoholic ginger beers with flavors like lime agave, pear rosemary and honey chamomile. “Anything that people are doing in beer, they have to take it to a new level,” Stephens adds. Many breweries are located in downtown Asheville, making it easy to map out your own pub crawl. If you fear you’ll never make it past the first tasting room, BREW-ed offers educational walking tours that focus on educating visitors about beer while hitting downtown breweries like Hi-Wire, Catawba and Twin Leaf. Tours can be booked at brew-ed.com. After logging some miles, you can treat your feet to a 45-minute herbal soak in a hammered copper cauldron at Wake Foot Sanctuary, 1 Page Avenue in downtown Asheville, open until 8 p.m. every day except Sunday. 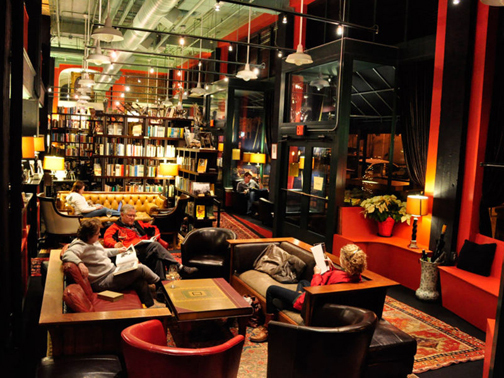 Then, step next door to Battery Park Book Exchange & Champagne Bar to browse thousands of used books while sipping a glass of wine or champagne. Battery Park is open until 11 p.m. Thursday through Saturday, and until 9 p.m. the rest of the week. Just down the street, The Captain’s Bookshelf has signed books, first editions and fine-bound volumes at 31 Page Ave. The same creativity that infuses the beer scene is present in Asheville’s culinary community, which sourced local ingredients long before it became a marketing tool. “‘Farm-to-table’ has always been here,” Stephens says. “Asheville is isolated so we had to have those relationships with our farmers to get those ingredients in our kitchens. The original Tupelo Honey is a downtown landmark for comfort food but Asheville also has a large number of high-end restaurants overseen by James Beard award nominees. At Rhubarb, renowned chef John Fleer’s “foothills cuisine” reflects the season, from whole trout to locally-raised pork with sides of locally-raised vegetables. Fleer’s more casual bakery/cafe, The Rhu, is a local hit for breakfast and lunch, with fresh takes on pastries such as the “croixette” – a cross between a croissant and a baguette. Chef Katie Button trained under the world’s best chefs before opening her restaurants Curate, which serves Spanish-style tapas in an Old-World atmosphere, and Nightbell, with elevated small-plate Appalachian cuisine and craft cocktails. Foothills Meats’ Butcher Bar & Kitchen is one of Stephens’ favorite new finds in West Asheville. Both a meat counter and a casual restaurant/pub, the kitchen sends out house-cured meat dishes such Slim Jims, tenderloin tartare, and smoked chicken kielbasa to tables embedded with cleavers. Finally, Stephens recommends White Labs Kitchen & Tap, a concept from one of the beer world’s best-known developers and suppliers of yeast for fermentation. When White Labs established its East Coast laboratory in Asheville, it also opened a taproom and kitchen that turns out dishes with an element of fermentation, such as wood-fired pizzas made with White Labs’ pure liquid yeast, fermented sauces, Kombucha cocktails, and beer-infused dishes and desserts. Lactobacillus, a bacterium normally used in yogurt and sour beer, is used here to make the outside of French fries extra crispy. “White Labs knew if they were going to open a tap room in Asheville, they’d have really steep competition, and I think they knocked it out of the park,” Stephens says. Many visitors come for outdoor activities, even in the winter. The Blue Ridge Parkway runs through Asheville, providing access to some of the East’s most scenic spots, from the extensive trail systems of the Pisgah National Forest to the easy 1.5 mile walk that leads to Catawba Falls. Stephens says hiking in the off-season can be an unexpected treat. “The views completely change and the trail that would have no view in the summer can be really expansive,” she points out. The Parkway Visitor Center at Mile 384, eight miles southeast of downtown Asheville, has maps and ideas for hikes of all levels. 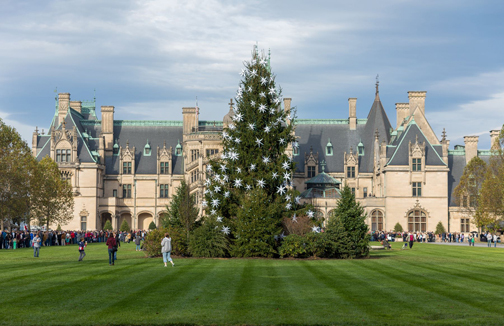 During Christmas at Biltmore, there are 55 decorated trees inside Biltmore House with an additional 35 trees across the estate. For those who prefer indoor hikes, Biltmore House & Gardens fits the bill. The 8,000-acre estate is the setting for the largest private residence in the United States, with 250 rooms spread over more than four acres, and attracts over a million people every year. Through Jan. 6, the estate is spectacularly decorated for the holiday season and features live performances of Christmas music during Candlelight Christmas Evenings. Tickets include admission to the festive Antler Hill Village & Winery, where you can browse the Biltmore shops for souvenirs and fine home goods and taste the estate’s own wines. High-end lodging is available at The Inn on Biltmore Estate or the Village Hotel on Biltmore Estate. The Vanderbilts have a connection to the ship: George and Edith Vanderbilt were scheduled to be on board the ship but canceled, avoiding near-certain drowning. George Vanderbilt built the estate. And from May to October, Biltmore House and Gardens will be the backdrop for a spectacular installation of Dale Chihuly glass works. Stephens says the occasion will shine a spotlight on a very active local artisan glass community, and events will be planned around it this summer. There used to be a saying about Birmingham: It’s a nice place to live but who would want to visit? These days, a lot of people want to visit. Birmingham has come a long way from the days when steel mill pollution darkened its skies. This year, the city earned a coveted slot on the New York Times’ 52 Places to Go list, shining a light on the urban revival efforts that have transformed the Avondale and Lakewood neighborhoods into hotspots for independent restaurants and nightlife. “You’d run out of stuff to do in a heartbeat because it was an industrial city and not much else,” recalls Tom Adkinson, a retired Nashville tourism professional who lived in Birmingham in the 70s. 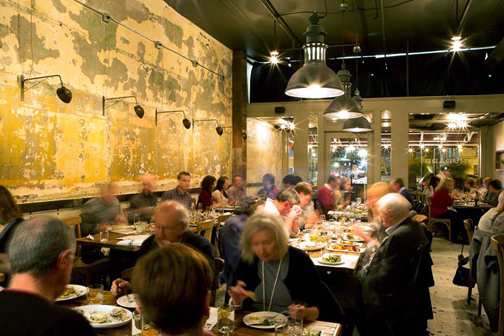 The city’s restaurant scene gets most of the acclaim from national media. Much of it stems from chef Frank Stitt, who opened the Highlands Bar & Grill in 1982 in the Southside neighborhood, where a number of protégés trained. “His fingerprints are on an amazing number of restaurants in Birmingham,” says Vickie Ashford, director of travel media for the Greater Birmingham Convention and Visitors Bureau. Stitt has two other restaurants in Southside: French bistro Chez Fonfon and Bottega for sophisticated Italian cuisine. Nearby is Hot and Hot Fish Club, opened by a Stitt alumnus. Over the past few years, developers have turned historic but neglected buildings into mixed use residential, retail and residential spaces. The Avondale neighborhood has benefited, with a number of casual hangouts in repurposed industrial buildings, including Rowe’s Service Station, a former garage that now serves hot sandwiches, chicken and waffles and shrimp and grits instead of gasoline, Post Office Pies, Avondale Brewery, and SAW’s Soul Kitchen, an outpost of the ever-popular SAW’s BBQ in Homewood. Last month, a developer purchased a large parcel of property in Avondale and announced plans to connect the area to downtown and make it more walkable. Birmingham’s Civil Rights Institute, which is celebrating its 25th anniversary this year. There is more to do in Birmingham than eat. The Birmingham Civil Rights District spans several blocks and in January was declared a National Monument, a designation of the National Park Service, by outgoing president Barack Obama. 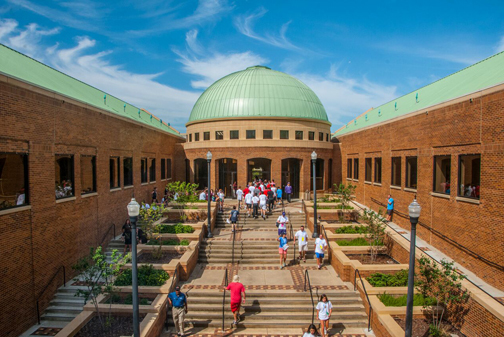 The centerpiece is the Birmingham Civil Rights Institute, which this year celebrates its 25th year telling the story of the civil rights struggle in Birmingham and tying it to the worldwide movement for human rights and equality. Its permanent collection includes exhibits like water fountains marked “White” and “Colored” – a stark and necessary reminder that the days of segregation were not so long ago. Also within the National Monument is the Sixteenth Street Baptist Church where four young girls were killed in a bombing in 1963. The city and the National Park Service will jointly fund the rehabilitation of the last piece of the District: the A.G. Gaston Motel, site of many meetings between Dr. Martin Luther King, Jr., Revs. Ralph David Abernathy and Fred L. Shuttlesworth, and other leaders of the civil rights movement. One can reflect – and walk off a few calories – at Railroad Park, a transformed 19-acre green space downtown that has an ice rink through January 1, free group exercises, and a summer symphony series. When it’s time to eat again, head over to Pizitz Food Hall, an eclectic food court with 15 stalls, one of which is a rent-free incubator for a new restaurant. The spectacularly restored Alabama Theatre and Lyric Theatre are nearby and host touring acts like John Prine, Jason Isbell, Graham Nash, Bela Fleck, Aimee Mann, Kelsea Ballerini, and the State Ballet Theatre of Russia this winter. For many people, the holidays are a time to ramp up. For others, it’s a time to retreat. If you’re in the latter camp, Shaker Village is the place for you. Located 25 miles from Lexington, Shaker Village is a perfect weekend escape. Shaker Village at Pleasant Hill is set on 3,000 acres of reclaimed Kentucky prairie that, between 1805 and 1910, was home to the third largest Shaker community in the United States. Today, guests stay in simple luxury in restored buildings furnished in Shaker style and eat meals prepared with sustainably-produced ingredients from Shaker Village’s own farm and apiary. “Shaker Village is a destination unto itself,” says Nashville attorney Elizabeth Betts Hickman, who has been visiting Shaker Village for 16 years, including twice this year. “If you have to have a giant screen TV or a 24-hour cocktail bar in your hotel, it’s not for you. Guests can stay in rooms, suites and private cottages among 13 historic buildings. Seasonal “seed-to-table” dining is available at The Trustees’ Table, which also hosts special events like the Jazz and Jambalaya Mardi Gras celebration Feb. 3. Afternoon tea is served at 2:30 p.m. on Saturdays, and Adirondack chairs placed around fire pits make cozy places to enjoy an evening cocktail or s’mores. The Historic Centre tells the story of the Pleasant Hill Shakers through artifacts on display and educational talks on history, agriculture, and the Shakers’ iconic architectural style, which valued simplicity and function. Daily programs include everything from craft workshops, nature walks and farm exploration to live music, yoga, wagon rides and, in season, stand-up paddleboarding and kayaking on the pond and nearby Kentucky River. The complex’s website is shakervillageky.org. Lexington is only 45 minutes away and makes a good home base for exploring five nearby distilleries: The Woodford Reserve, Wild Turkey, Buffalo Trace, Four Roses and Town Branch Distillery. Distilleries manage their own tours, or Central Kentucky Tours runs an excellent “Barrel to Bottle” touring visit that transports guests to several distilleries and tasting rooms, as well as historical sites and Kentucky Cooperage, one of the largest bourbon barrel manufacturers in the world. Information is available at centralkentuckytours.com. 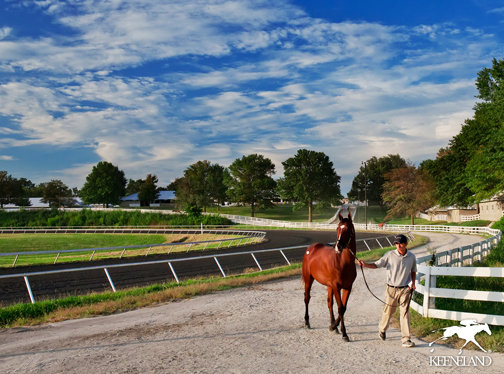 January and February are breeding months for Kentucky’s other signature industry – horse farms. Horse Farm Tours, Inc. (horsefarmtours.com) caters to those wanting a close-up look at the operations behind some of the biggest commercial horse farms around Lexington. Racing enthusiasts will want to visit Claiborne Farm, where Triple Crown thoroughbred Secretariat is buried, as well as the storied Keeneland Racecourse, a National Historic Landmark that offers tours year-round (keeneland.com). For a special treat, visit Keeneland between 6-10 a.m. to watch horses being trained, then have breakfast with the jockeys, trainers, and grooms at the Track Kitchen, a cafeteria near the barns. St. Louis has charms that only a local can reveal. Beyond the Gateway Arch are historic neighborhoods filled with graceful architecture, picturesque storefronts and romantic parks that St. Louisans point out with pride. Preservation and adaptive reuse are transforming the industrial city, from the funky Cherokee Street corridor to the Chouteau Greenway that will create a bike-and pedestrian-friendly path from the Gateway Arch downtown all the way up to Forest Park at the city limits. There’s plenty of work ahead to restore St. Louis to its Gilded Age glory, but residents maintain a staunch pride in their city’s gems. “People grow up here and never leave. Or they leave and come back,” says Lisa Jenkins Oltz, a music manager who moved there from Nashville nine years ago when her husband’s work brought him to Washington University in St. Louis. “It’s similar to Nashville, except Nashville’s exploded and is kind of out of control,” she adds. 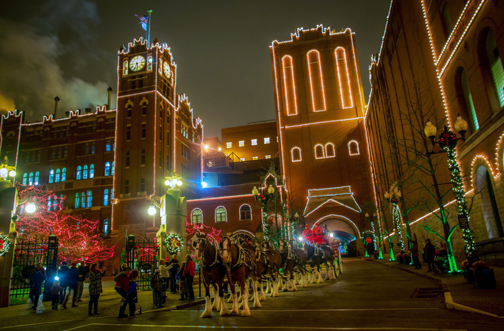 The Anheuser-Busch Brewery Lights waking tours take place Thursdays through Sundays through December 30 (except Christmas Eve). Another favorite is Planter’s House, an atmospheric cocktail bar and restaurant in the former landmark Planter’s Hotel, located at 1000 Mississippi Avenue in Lafayette Square. Even if you’re a craft beer fan who looks down on mass-produced beer, a tour of the Anheuser-Busch brewing complex is a fascinating look at St. Louis history. Spanning blocks of the historic Soulard neighborhood, inside the brewery walls are horse stables that house the iconic Budweiser Clydesdales. The complex includes three National Historic Landmarks. Tours are offered year-round, from a complimentary 45-minute tour to a two-hour Beermaster Tour that costs $35 and includes a sample directly from a finishing tank. Through Dec. 30, the brewery holds its annual Brewery Lights festival, with free admission that includes a wristband for five 5 oz. samples of beer for those 21 and up and access to fire pits, ice skating on the Bud Light Ice Rink, a s’mores station, appearances by the Clydesdales and food and drink for all ages in the Biergarten. 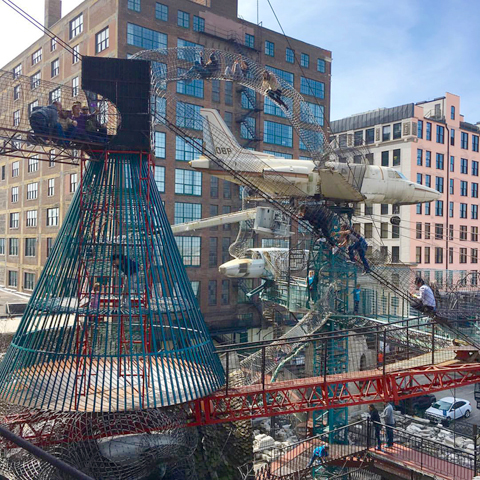 If Fred Sanford, Willy Wonka, and Pee Wee Herman started an architecture firm, they might come up with City Museum, a 10-story, indoor/outdoor downtown playground for adults and children that is jam-packed with tunnels, cranes, slides, bridges, rope walks, old airplanes, a school bus, a fire truck – all designed to be scaled, clambered on, or slid down (lawyers will marvel at the potential liability around every corner.) The rooftop boasts a full-size Ferris wheel. Closed-toe shoes and long pants strongly recommended. Visitors can spend days in Forest Park, the massive city park that is the seventh-largest in the country. Forest Park was a major site of the 1904 World’s Fair and has numerous free attractions, including the Missouri History Museum, Saint Louis Art Museum, Saint Louis Science Center and Planetarium, and the excellent Saint Louis Zoo, which is open daily throughout the winter except Christmas and New Year’s Day. Within the park is Steinberg Skating Rink, the largest outdoor skating rink in the Midwest, open every day and late night, including the holidays, until March 1st. Cost is $7 for a full-day skating pass and $6 for skate rental. Wintertime is magical in the Central West End, an historic walkable urban neighborhood that combines a stunning mix of architectural styles with a modern mix of more than 125 restaurants, shops, bars, and galleries. The CWE’s main commercial street is Euclid Avenue, connecting Maryland Plaza, McPherson Avenue and Washington Avenue. On Dec. 16 and 23 the CWE hosts its annual Window Walk, a chance to stroll the beautifully lit and decorated streets and get in the holiday spirit with live music, ice carving, carriage rides, Santa visits and children’s activities. Also in the neighborhood is Bowood Farms, a repurposed warehouse/greenhouse that houses the charming Cafe Osage for breakfast and lunch and a wonderful selection of plants and gifts for the home. Renovations to the park surrounding the Gateway Arch may slow visits somewhat, but no trip to St. Louis is complete without a ride to the top. Guests board a tram for the four-minute ride to the top and are treated to panoramic views of the city. The Gateway Arch Ticketing & Visitor Center has temporarily relocated to the Old Courthouse at 11 N. 4th Street during construction. After the Arch, a visit to Crown Candy Kitchen will please kids and adults. The downtown soda fountain has been serving malt milkshakes, burgers, and ice cream at 1401 St Louis Ave. for more than 100 years. For a final stop, visit Chuck Berry’s grave in Bellerive Heritage Gardens. The father of rock and roll, who played every month at Blueberry Hill in the lively Delmar Loop area, died in March. Also, buried in the same cemetery is baseball Hall of Famer Stan Musial.